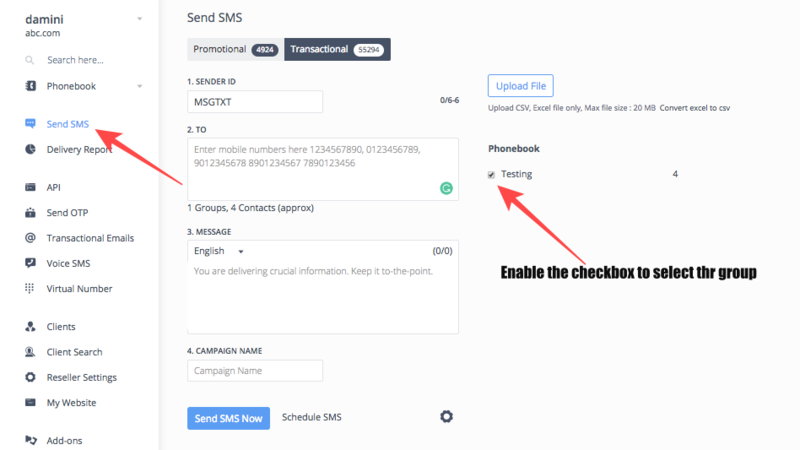 You can choose Group option to send SMS in Bulk. The Send SMS on Group feature save your time, just save your group once with the numbers of data and you can use it anytime to send the Bulk SMS. 1. Select "Send SMS" on the panel. 2. Select/Enter the Sender ID through which you want to send the SMS. 3. Click in the mobile number field and all created group in phonebook appears at the right-hand side of the screen, you can select group to send SMS. 4. Type in the content of the SMS you wish to send. 5. Select the name of the campaign (optional), and Click on send.